Gallery Seven provides the best time and again. Fashioned of top-grain genuine leather belts for men, Gallery Seven dress belts for men won't tater or wear out on you. Our stark, rectangular silver-tone, scratch resistance belt buckles are fabricated with Zinc Alloy to protect it from corrosion. What makes the Gallery Seven belt exclusively attractive? Its fine combination of charm and practicality. Gallery Seven creates finely crafted choice leather belt men experience of exceptional good looks, comfort, constancy, and performance. Gallery seven carefully perforated double loops in just the right spot on the leather belts strap to fulfill their commitment providing a perfect fit every guy needs. Available to you in a brimful variety of colors for easy pairing with your wardrobe, makes this belt belts for men a basic essential. We know the hassle of looking for that perfect gift, come valentine's day gifts for him as well as Christmas, Father's Day gifts, anniversary gifts, birthday gifts for men or just any lucky day. Well, we got you covered! No need to go store hopping any longer! Your loved ones will ooh and aah over the cool gift packaging. So, go ahead and make your loved one's day, Today! We are so sure you'll love our Gallery Seven single prong leather belts for men that we're ready to back it up with a full 30-day warranty. Return & receive refund-No questions asked. Talk about customer satisfaction. Because you are worth it! VERSATILE- Finish your dressed appearance with this double loop keeper mens belt. 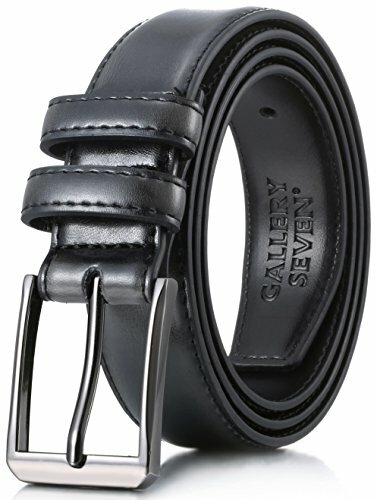 Gallery Seven Men's leather belt is constructed of high-quality. Outfit your suit, chinos, or jeans, with this 1.25" wide dress belt to create the look you crave. SIGNATURE TRADEMARK- This polished genuine leather belt has stitched edges and features a double keeper loop as well as a stark rectangular silver-tone buckle. WINNER FACTORS - Gallery seven carefully perforated double loops in just the right spot on the mens belts quality leather strap to achieve the ideal fit. Available to you in a brimful variety of colors for easy pairing with your wardrobe, makes this mens dress belt a ideal fit for your every day basic essential. ELEGANT PACKAGING - Bestow your loved one's with the ultimate gifting experience! Polished, upscale packaging makes this stylish mens leather belt the ideal gift for any occasion! Christmas or Father's Day or Just an 'I love You' gesture, the Gallery Seven quality belt covers it all! TRUST IN GALLERY SEVEN - We are so sure you'll love your leather belt that we're ready to back your purchase for a full 30 days. Get a full refund if you're anything less than lovin' it. Just return or exchange. If you have any questions about this product by Gallery Seven, contact us by completing and submitting the form below. If you are looking for a specif part number, please include it with your message.